Step 1 Are you a candidate? We’ll be checking for signs of gum disease, blood disorders, and bone diseases. Having good bone quality is important when getting implants. Step 2 What is a dental implant? Dental implants are an option to replace missing teeth, which can negatively impact oral health. Dental implants are a permanent and durable solution; the natural look of implants will allow them to blend in with your original teeth. Step 3 Where is the dental implant going? The area of your mouth where the implant will be placed will be evaluated using a 3D CT scan. This will allow us to see the anatomy in the area, and determine if other procedures like bone grafts will need to be performed. It will allow us to visualize the bone and nerves in the surrounding area, as well as the adjacent teeth. Step 4 Are dental implants right for you? Depending on the results of the previous two steps, and after discussing your questions and concerns, we will determine whether dental implants are right for you. If they are not, we will discuss other options with you, including dental crowns, dental bridges, or dentures. Step 5 Which dental implant is right for you? Once your case is accepted, your 3D CT scan and co-diagnostic software will be used to choose the right size of dental implant for you from a library of implant sizes and manufacturers. The implant will be virtually positioned in your mouth in a computer mode before placing the real implant. Step 6 How is the dental implant placed? 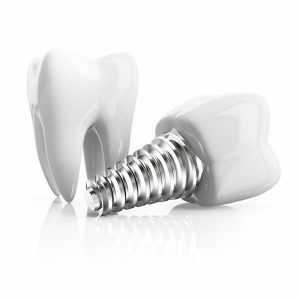 The dental implant selected for you will be fitted in place of your missing tooth. The implant, which is a titanium, will be surgically placed into the jaw bone. The post acts as an artificial tooth root. Step 7 How long is healing time? Once the titanium post of the implant is placed, we will give it about 4 to 6 months to heal. This will give the implant time to integrate with the bone around it – a process known as osseointegration. Step 8 How is the dental implant finished? After the implant has healed, either a crown or bridge will be placed on top of it to complete the look of a new durable, and natural-looking tooth. Step 9 How much will it cost? The cost of the implant is $2575, and the cost of the crown is $1622. Depending on your situation, additional procedures may also be required (see step 2).